Audrey Claire turned 1 on Friday. She is still toothless, chubby & the happiest baby ever. But she has learned so many new things in the past several weeks, it is easy to see she’s growing up. (Insert both happy and sad faces). Audrey is very close to walking. She has started to say some words, including “Eya” (Ella), “Mo” (More), “Uh-oh”, “Dada”, “Mama” and occasionally, “Baby”. She also shakes her head no or yes and signs “more”. We’re working on the signs for “milk”, “thank you” and “all done”. She has also started to dance. When she has pulled herself up to standing, she will just lean against something so she has 2 hands free to either hold stuff, clap her hands or dance to the music that’s on. She is waving bye-bye (or hello sometimes). She loves the dog & will follow her around & pat her. She imitates lots of sounds including dinosaur roaring, airplane sounds, coughing, laughing, singing, blowing raspberries & other sticking your tongue out sounds. Audrey is obsessed with balls & balloons! She will pick up a ball & throw it to you, or for herself & then go get it. I think we have a little athlete on our hands. She is fearless. She can’t even really walk yet, but she will climb up stuff. Luckily, we were at the mall play area when I discovered this so the floor was cushioned in case of a fall. She eats almost all solid foods now, even without any teeth. We just cut up whatever we’re eating into tiny pieces and she eats it! The few things she hasn’t liked so far are watermelon, cucumber & pepperoni. But this girl is definitely not a vegetarian…she loves sloppy joe, salsa chicken & turkey! In general, she is the happiest baby ever. She will cry when she’s tired or really hungry, or the occasional drama between siblings. But Ella is her favorite person & they are so cute together. They are so sweet to each other (mostly) and they make each other laugh all day. Ella always wants to take care of Audrey & Audrey adores Ella & wants to do everything she is doing. Audrey’s face lights up & she can’t contain her excitement when she sees Ella each morning. It is the best start to each day! 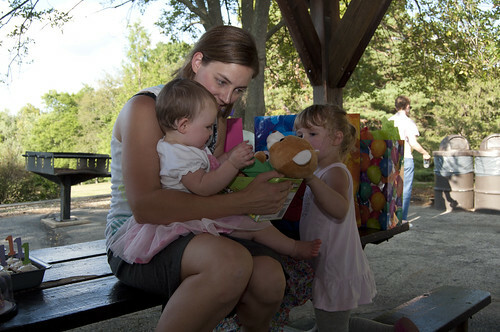 Audrey’s first birthday party was small, but sweet & fun – perfect for her. 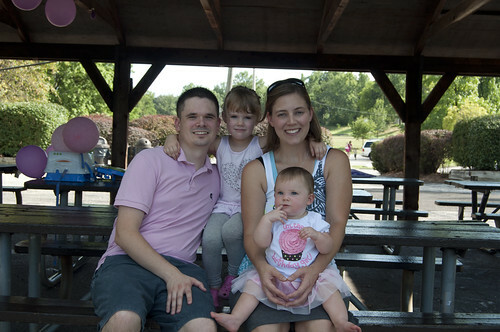 We had her party at the same pavilion & park where Ella’s first birthday occurred! Audrey loved looking at the birthday cards, but her very favorite part was eating the cake! 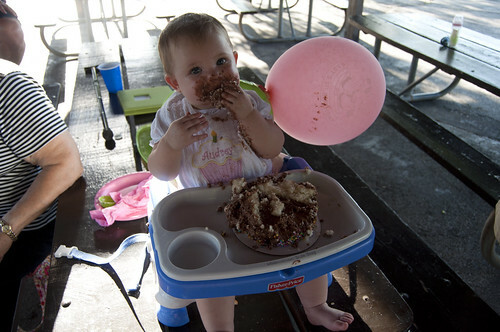 She ate about half of the little cake we got for her…I don’t know how she stuffed it all in there! I can’t believe my baby is 1 already. It has been a whirlwind of a year. But I can’t imagine our lives without her now. She is a perfect fit in our little family and we love her so much.